Why do so many people seem to have a problem with finishing off a project? When the last deliverable is delivered, your done, right? WRONG! Once you are done, there is still work to do. I guarantee that the paperwork will still need to be completed; lessons learned compiled and saved in a format you can use the next time; files need to be stored; and last, recognize the team so that they know they are appreciated! So many people will finish the last deliverable for a project or job and start moving onto the next one, but that means you are leaving unfinished work and missing an opportunity. I can hear many of you groaning already. In fact, I groan to think about it too… but if you can’t think of it as Completing, think of it as setting yourself up for success. The reason I say this is that the lessons learned will help the team learn from a mistake rather than repeat it. The storage of files and paperwork removes clutter, and if properly done, can be quickly accessed in cases of audit, or heaven forbid you find yourself redoing the work after a disaster. Finishing the paperwork provides the same benefits. Bills of Lading, Invoices, shipping documents all need to be processed and cataloged for future references. Do not let these slip unless you want to find yourself digging through reams of paper trying to find a document from 2 jobs ago. And what about recognition? Once a project/job is done, doesn’t the team at least deserve some “kudos.” I think that the leader should at least hold a team meeting and say “Thank you” for the long hours and work that the team put in. At best, I would hope the leader is hosting some type of event (even if it is just a jaunt to the local watering hole), and is recognizing individual contributions with some type of reward or certificate (a lot of the military does this through “Challenge Coins,” a useful tool to have). 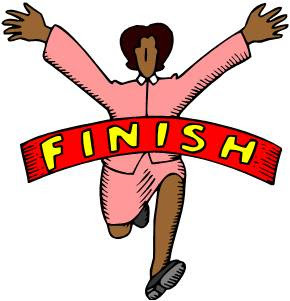 So the next time you find yourself nearing the finish line, take a look at the job and decide if you are Complete. It isn’t easy to do, but you are setting yourself up for success with goodwill from your team, lessons learned to prevent mistakes, and proper paperwork to keep the auditors happy and off your back. How often have you Completed a job?